Berwick took a point from a battling 2-2 draw against Edinburgh City on Wednesday, goals from Greg Rutherford and Steven Thomson earning them a share of the spoils at Meadowbank. Rutherford had fired Rangers into a 31st-minute lead after being set up by strike partner Aaron Murrell. 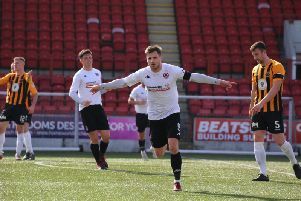 It was the only goal of the first half, but just three minutes into the second half the capital side equalised when the experienced Derek Riordan headed in from a cross by Marc Laird. The city slickers then got their noses in front with a 71st-minute close-range effort from Dougie Gair, but leading goalscorer Thomson, with his 12th of the season, meant sure Rangers did not leave empty handed when he found the net with a shot from the right side of the box in the 80th minute. There were several chances at both ends throughout an entertaining game, but in the end both teams had to settle for a point which was probably a fair result. Rangers made several changes to the team which lost 3-1 at home to Cowdenbeath with Kevin McKinlay returning from suspension and David Verlaque and Murrell both handed starts. Berwick manager John Couglin said: “We had to make a change to the personnel because I thought we looked jaded in our last match against Cowdenbeath. “After Saturday’s defeat it was important we did not lose again, especially after Cowdenbeath won again on Tuesday. Berwick: Brennan, Spark, Hamilton, Scullion, McKinlay, Verlaque (Phillips 84), McKirdy (Notman 90), Lavery, Thomson, Murrell, Rutherford.